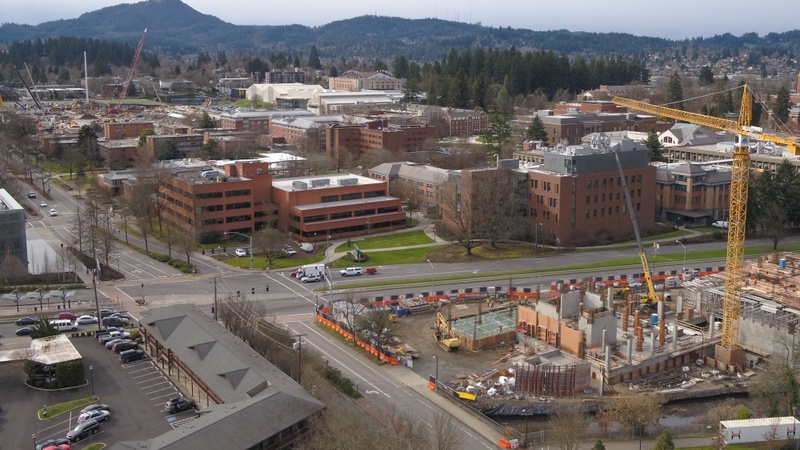 From money brought in by students, visitors and research grants to spending on employment, supplies and construction, the UO remains an economic engine not just in Lane County but statewide, a new report shows. The university’s estimated economic footprint in Oregon was $2.2 billion in fiscal year 2017-18, according to UO economist Tim Duy, who has been producing the study for the university since 2010. That figure captures the total amount of economic activity associated with the university, which ripples outward to shape the state’s economy. However, what’s also notable is the share of economic activity generated from money that flows into Oregon from outside the state through university activities, such as federal research grants and spending by students and visitors from outside Oregon, spending that wouldn’t happen without the UO. Seen through that lens, spending by the university, students and visitors, combined with construction spending, had an economic impact of $1.2 billion. Of that, an estimated $781 million came from outside the state, injecting 15,387 jobs with $577 million in payroll into the state’s economy. Absent the influx of resources from out of state, the UO would essentially be recirculating Oregonians’ money within Oregon. While there is a benefit to that, the influx of money from beyond Oregon’s borders has a greater effect. “The University of Oregon acts as a trade-sector firm in our economy, drawing in revenue from outside the state in the form of tuition and research grants. This funding substantially contributes to the Oregon economy,” said Duy, who also is senior director of the Oregon Economic Forum. Looking at the university using a narrower definition of economic impact, the UO spent $561 million related to students and grants that came from outside its borders, generating an economic impact of $1.1 billion, including $438 million in pay associated with 11,794 jobs. After the economic boost generated by the university itself, new economic activity generated by student spending represents the second-largest contribution to the university’s effect on Oregon’s economy. Students spent $261 million on rent, food, books and supplies, and other goods; roughly half of that came from out-of-state students. That out-of-state spending generated an economic impact of $226 million statewide in the past fiscal year and supported 2,243 jobs that paid $55 million to workers. Boosted by an academic reputation that extends beyond Oregon, enrollment of nonresident students rose from 47.7 percent to 49.1 percent as the percentage of total tuition and fees from nonresidents students hit 67 percent. “A larger percentage of nonresident students boosts the economic impact of the University of Oregon because it represents a larger draw of resources from out of state,” Duy wrote in his study. Perhaps the most visible element of the university’s economic benefit can be found high in the sky with the construction cranes that have popped up around campus in recent years. It’s been said the number of construction cranes that dot a city’s skyline represent a barometer of an area’s economic health. Using that measure, the UO is in fine shape. At times over the past year, cranes could be found on construction sites for Willie and Donald Tykeson Hall, the Knight Campus for Accelerating Scientific Impact, Hayward Field and, more recently, University Health Center renovations. In all, construction spending generated an economic impact of $196 million in 2017-18, with $72 million in payroll that supported 1,537 jobs. Thanks to campus tours, commencement ceremonies, athletic events, concerts and conferences, the UO also gives a healthy boost to Oregon’s tourism industry. One only has to look on the edges of campus to see the number of lodging establishments and eateries that seek to house and nourish the many people who have the UO campus as their destination. Spending by visitors equaled $27 million, generating an economic impact of $51 million with 475 jobs and earnings of $15 million. But the university’s benefits to the economic health of Lane County and Oregon extends beyond dollars and cents, Duy added. Duy is author of the University of Oregon Statewide Economic Indicators, Regional Economic Indicators and the Central Oregon Business Index. He has published in the Journal of Economics and Business and is also a member of the Governor’s Council of Economic Advisors and the State Debt Policy Advisory Commission. He also produces the monthly UO Index of Economic Indicators, which tracks state and regional prosperity. Duy’s economic impact study is one of several tools the university uses to measure the UO’s contributions to state and regional economies. The Oregon Impact interactive map demonstrates the fiscal and community impacts of the university on the state by geographic and legislative districts. The map is a collaborative effort between Campus GIS and Mapping, Institutional Research, and Government and Community Relations.